Filing cabinets. At some businesses, filing cabinets are merely graveyards for old papers. Keep only the papers and files that you must and recycle (or shred) the rest. Language. Using buzz-words and let-met-try-to-impress-you language in your writing and speech can cause confusion, reduce productivity, and waste resources. A good rule of thumb is that if you can find the phrase in Unsuck-It‘s dictionary, you should think twice before using it. Direct language that is simple to understand will save you time and improve your communication skills. Top of your desk. The only items that should be on the top of your desk are the equipment you use at least once a day and the project you are working on currently. Pack up your project when you move on to the next task (I like using one flat file per project), and store in drawers and cupboards items you don’t use daily. Meetings and cable clutter typically round out the top five hiding spots for clutter in offices. 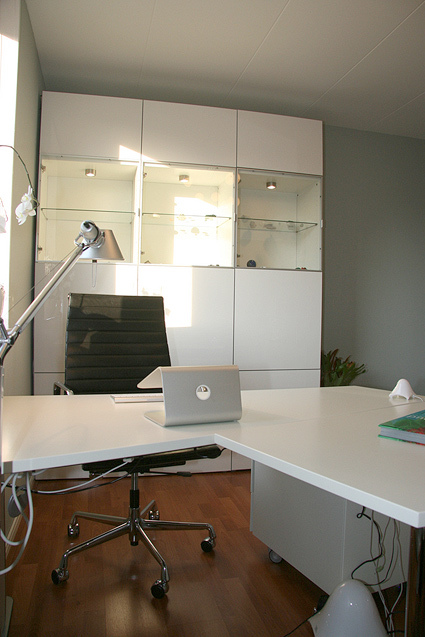 Where is the clutter in your office? Schedule 10 minutes a day to address your clutter issues and in a few weeks your office can be the last place clutter will be able to hide. 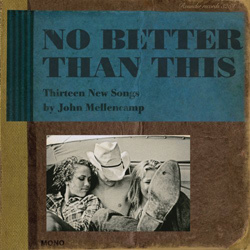 A few days ago I picked up a copy of No Better Than This, the new Rounder Records debut album from John Mellencamp (AKA “Johnny Cougar,” “John Cougar,” “John Cougar Mellencamp”). I definitely wouldn’t describe myself as a fan of the Coug, but this particular collection of recordings was produced by T-Bone Burnett. I would buy a $300 box set of audio test patterns if it was produced by T-Bone Burnett. What’s intriguing about No Better Than This is that all the tracks on the album were recorded at historic locations with a single microphone on a 1955 Ampex portable recording machine (with no overdubs). We’ve written before about the benefits that self-imposed limitations can bring to creative work. 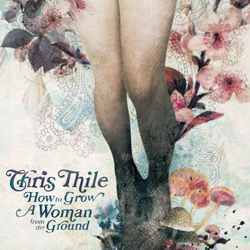 In the particular case, the low-tech (and deceptively simple) approach to the audio production lends many of the songs on the album a raw and honest quality that you don’t usually hear on modern recordings. It’s mind-numbing to think that this whole album was recorded (under false-pretenses) at the Church of the Holy Trinity in Ontario in just over a day with a budget of $250. They even ended up with so much good material that not everything from the session ended up on the original Latent Records release. This impromptu recording actually won the the Grammy Award for Best World Music Album in 1994. All the tracks on the album were entirely improvised by the four musicians involved in project. 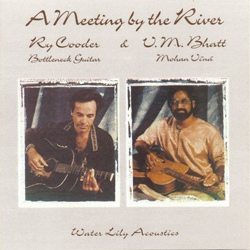 If you have any affinity for acoustic slide-guitar recordings, this Water Lily Acoustics release is a must-have. It’s also possibly the “warmest” sounding recording that I’ve ever heard. Single-mic recordings aren’t all that uncommon for bluegrass bands trying to capture the same sound that’s present on early Bill Monroe and Flatt & Scruggs recordings. 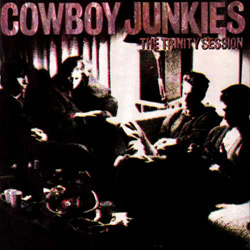 It is, however, quite rare to hear that kind of unvarnished production on bluegrass covers of angst-ridden songs by The Strokes and The White Stripes. If anything, these recordings should definitively prove that you don’t need the newest or most-technologically advanced tools to produce great music. The first thing that caught our eye in this workspace was the chair. It’s the EA 119 “Executive” model from the Aluminum Group collection, which was designed by Charles and Ray Eames in 1958. The EA 119 is a very swank and substantial piece of furniture, especially when compared to most of today’s popular “task chairs.” Right now I’m seriously contemplating whether I should eat cat food for the next six months so I can justify buying one. 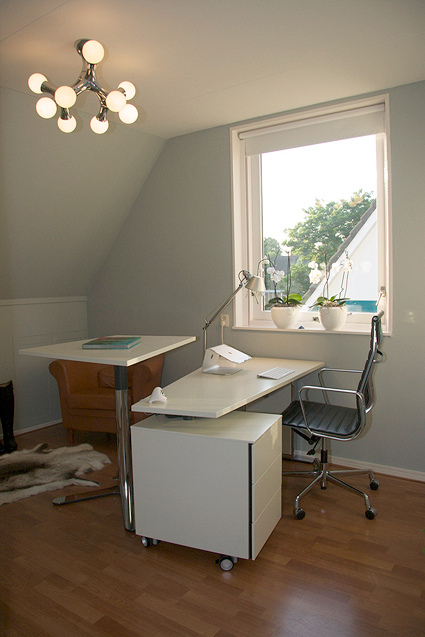 Another thing we like about this study is the second work surface immediately behind the primary desk. It is height adjustable (with a footswitch) so it can be used as a standing desk. Both pieces are available from Hülsta. Being able to move around and have different work-surfaces can increase productivity. The five stages of the buying process are Kick-off, Research, Purchase, Ownership, and Word-of-Mouth. Barletta’s research found that the only stage of the purchasing process men dominate is the actual laying down of the cash, and that women are in control of the other four. Then, she implies that men don’t actually control the buying, even though they think they do. Once the decision has been made to make a purchase, it is the woman who does research to develop the short list. She may begin with numerous options, but she is very detail oriented as she narrows the field … They consult with close friends and family, as well as experts, Web social networking, local news and magazines. Once she feels she has investigated all of her options thoroughly, she compiles the short list or makes a final decision. It is this list or choice that she shares with the man. So if your product or service doesn’t make it on this list, it is very unlikely it will be considered when it comes time to make the purchase. After all of the research and time she has put into it, she typically knows exactly what she wants. In my relationship with my husband, we usually alternate who is the researcher and who is the buyer based upon who is interested in the purchase. Having the researcher not being the person who is putting down the money for the product usually means that we’re spending more wisely than we do independently. We’re smarter consumers because there are two of us involved in the process. Even if the research is true and the majority of women in relationships do control the five stages of the buying process, it doesn’t always have to be this way in your home. You can mix things up as a way to keep your spending in check and be smarter consumers. If you’re not in a relationship, you can use these five stages as a checklist to ensure that you’re being a smart consumer and not simply purchasing things on impulse. Overall, I found this article to be a fascinating analysis on the buying process and how products find their way into our homes. The more we know about the science of buying, the better, more informed consumers we can be. Thanks to reader Deb for introducing us to this research. Mmmmmmmm, bacon. Bacon is so yummy, but it is extremely difficult to detect when it’s on a table next to other breakfast foods. Voice-over: Does this happen to you? Woman: [Stabbing an egg with a fork.] Is that bacon? [Tastes food on fork.] No! Yuck! Those are eggs. I’m so full and I haven’t even figured out which plate has bacon on it! To end the confusion and help your family know which food is bacon and which food isn’t, you need to put it on the obvious Bacon Platter! Warning! The Bacon Platter is for bacon only. You and your family will be even more confused if you put sausage, pancakes, or other breakfast foods on it. And you don’t want to confuse your family, do you? Also, when serving bacon on your awesome Bacon Platter, you should definitely consider using canned bacon. There is no bacon like canned bacon. 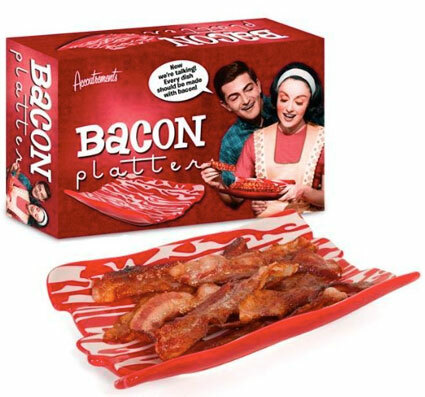 Thanks to reader Linda for finding the Bacon Platter and bringing it to our attention. Rachel Ray’s website has nine great back-to-school organizing tips to help get your little ones ready for the new year in the article “Back To School Planning” by Katie Hetter. For those in the northern hemisphere, just 28 days of summer linger on the calendar. Before the cool days of fall and winter set in, now is the time to finish up warm-weather uncluttering projects that remain on your to-do list. Your garage. If you haven’t already cleared the clutter from your garage this season, now is a great time to take advantage of the access you have to your driveway. Pull everything out of your garage and sort it into piles: Keep, Purge, Other. Clean your garage (starting at the top of the room and working your way down), make any necessary repairs and/or add organizing systems, and then return only the “Keep” pile items to the space. Donate, recycle, and/or trash the items from the “Purge” pile, and return the items in the “Other” pile to their owners or the places they belong in your home. Your car. Similar to the process used on your garage, do the same with your car. Don’t forget small areas like the glovebox and the console. Trash cans and litter boxes. Now is the perfect time to haul your trash cans and litter boxes to your local self-service car wash and give all of them a deep cleaning. Set them in the bright sun for a few minutes to dry before hauling them back to your place, stink free. Your chimney. Before the rush of callers pour in to your local chimney sweep, give him a call and schedule an appointment now. This way, you won’t have to wait to start up your fireplace on the first cool night of the season. Whatever tasks remain on your summer to-do list, schedule and take on those tasks now before the weather keeps you from doing them. I keep lists, lots of lists, and my friend Brittany thinks this habit is “adorable” and “precious.” She recently sent me a link to author Amy Krouse Rosenthal’s website (a link that is NOT safe for work) about a list Amy has decided to keep. In opposition to a bucket list (a list of things you wish to do before you kick the bucket), Amy has also started a list of things she doesn’t want to do. The name of her list rhymes with bucket but begins with the letter F. If you didn’t click on the link above, just think about it for a second and you’ll eventually figure out why I’m not naming it outright on our family-friendly website. Brittany is well aware of the fact that I already have a list such as this, though mine is lacking Amy’s naming creativity and is simply called: “Things I won’t do again.” This list is as important to me and the way I live my life as is my list of things I want to do. Often, expressing what you won’t do leads to very positive results. For example, when I was in my 20s, I abandoned my car in the middle of the street to engage in an intense yelling match with a woman over a parking space. There was a lot of nonsensical screaming about how I felt entitled to a spot that this woman stole from me — and, well, the police became involved. I wasn’t protesting against human trafficking or genocide or something actually horrific, I was on the verge of being arrested over a small piece of pavement in front of a CVS Pharmacy. Hours later, when I had calmed down, the embarrassment of the situation led me to write “I will never fight with anyone over a stupid parking space again” at the top of a new list. In DC, where parking can be a nightmare, this life rule has led me to be calmer when hunting for parking, kept me out of jail, and also out of physical harm. I will not go more than a week without doing the laundry (except in cases of a structural impediment, like being without power, or when on vacation). I will not throw my clothes on the floor and I will not put wet clothes or towels in the hamper. I will not keep a gift out of guilt. I will never abandon a pan on the stove for hours with food still in it that needs to be disposed or refrigerated. This list is especially good at motivating me to stay on top of my responsibilities. In the evenings, when the siren call of the television and comfy couch are singing my name, I’ll first take care of chores before kicking up my feet and relaxing. I’ll say to myself, “I don’t go more than a week without doing the laundry,” and then put a load of clothes in the washing machine. Do you have a “Things I won’t do again” list, or a more creatively named one like Amy? If you think it could motivate you to change your behavior in a positive way, maybe this strategy could work for you. It has certainly helped me to maintain an uncluttered life. Everyone gets organized at some point, they just might not be around for it. DeRoos’ comment was morbid, but absolutely true. At some point, someone is responsible for sorting, purging, and getting your affairs in order — either you do it while you’re alive, or your loved ones do it after your gone. I probably wouldn’t have kept [a set of Wedgwood cornflower blue china inherited from my mother’s mother] if I had bought them in a junk shop 20 years ago. But they were my grandmother’s, so I keep them safe, and take them out a few times a year for family celebrations. As I wash each piece by hand, I wonder, with a pang of melancholy, if my daughter will someday do the same. I had somewhat of a negative reaction to Lupton’s piece. I stand more firmly in DeRoos’ camp. I think that if you truly love people, you don’t want to burden them with your clutter after you’re gone. You want to make things as simple as possible for them, not bog them down with guilt, piles of stuff, and responsibilities. I hope to ease their grief, not make it worse. What are your reactions to the DeRoos quote and Lupton’s piece? What are your thoughts about what you plan to leave behind? Yes, it’s morbid to ponder, but we are mortal. What do you want to be your legacy? We’re setting the display on our bedroom dresser so we will also have a place to safely store our glasses overnight and make them easy to find first thing in the morning. Because glasses are much less expensive than they used to be (thank you, Internet!) it’s becoming more common for people to have multiple styles of frames, the way they might have a few belts or purses. 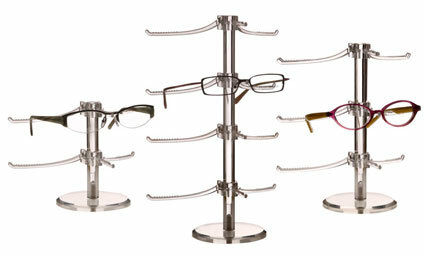 If you’re in this group of owning multiple pairs of glasses, an eyeglass shop display stand might be a good organizing tool for you, too. Do you use a different organizing method for storing your eyeglasses? Give us your tips in the comments.